Bruce had a long flight that day, about 9 hours in the air. We were together in the radio room at 5:30 pm for the evening call-up. As soon as we turned on the radio, we got an emergency call. “Please come with the plane quickly, there has been an accident! Hurry!” was the cry. As soon as Bruce heard that, he dropped the mic, and raced toward the hangar. Fortunately the plane was still outside. He jumped in and took-off for a nearby airstrip. Bruce landed within 10 minutes of receiving the call. 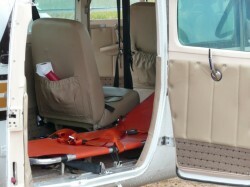 He arrived before the patient could be taken from the accident site. 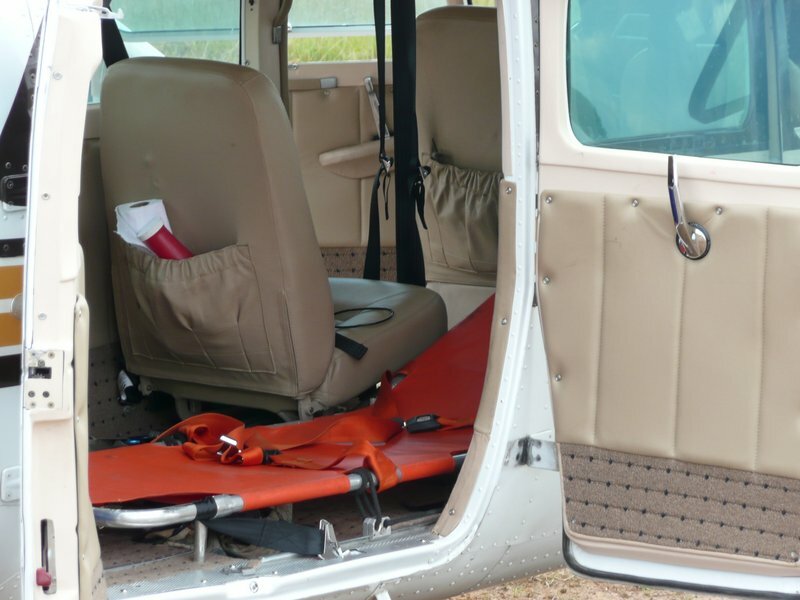 When they brought the patient to the plane, they carefully laid him on the stretcher. Six minutes later, the plane landed back at Kalene and he was rushed into theater at the hospital. Unfortunately he didn’t make it, but his loved ones know that he was with the Lord. They were thankful that the plane was here, ready to go, and all that could be done was done. The rainy season was well under way, and the Zambezi River was overflowing its banks for many miles in Western Province, as it usually does at that time of the year. My passenger was working with the Refugee Camp, and needed to find out if the road was clear. The lorry carrying the container of supplies needed to get through to the Camp. As we flew along the road, we came to a section that was under water. As we circled around the flooded road, we noticed an object submerged under the water. It was a lorry (a large truck)! In fact, it was not just one, but two lorries completely submerged! Wow! That’s what I call being stuck! It was obvious that the lorry carrying the container would have to send its cargo by boat, or wait 5 months for the dry season. arrival at Lusaka, the ambulance was there waiting to take the patient to the orthopedic hospital. The next day, John learned that the older man had passed away, due to internal injuries. 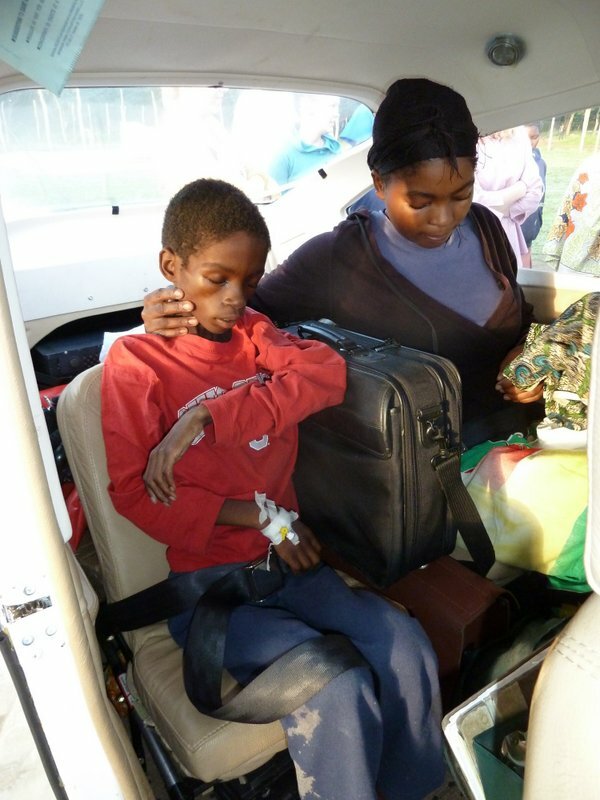 The hospital asked if we could fly the other patient to Harare, which John did, and the ambulance took him from there. Unfortunately, they were unable to treat him either, so he was later evacuated to South Africa. He is now doing well. 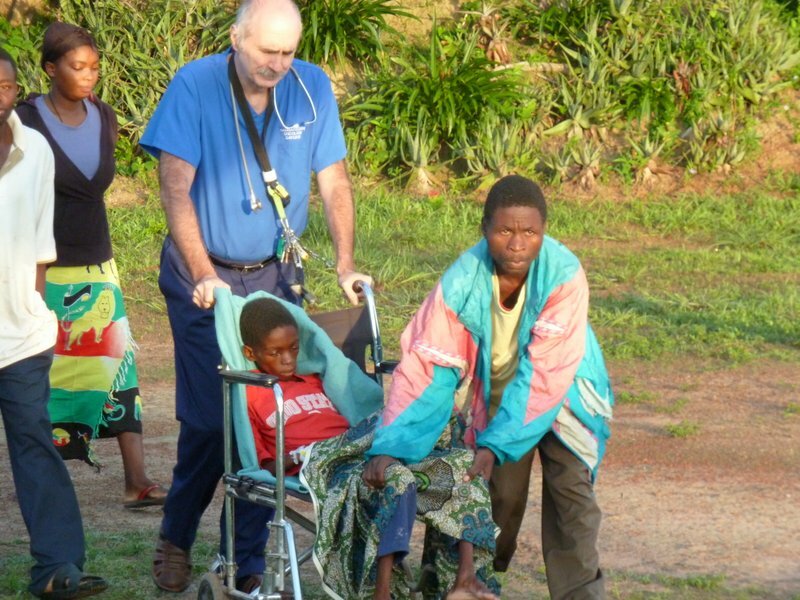 The next day, after returning from Harare, Zimbabwe, John flew the body of the older man, together with relatives back up to Kalene for the funeral. The man was born, and is buried on Kalene Hill. His wife, due to illness, joined him a few months later. They are now together with the Lord.